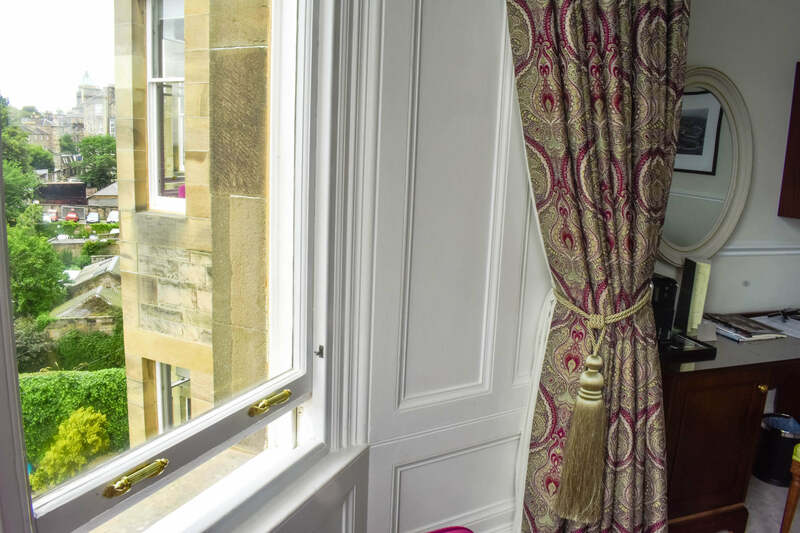 If you’re planning a trip to Edinburgh, then you’re looking for great value accommodation in the city. The good news is you’ll find a lot of options. The bad news is you’ll have a lot of options. I can make it a little easier for you. 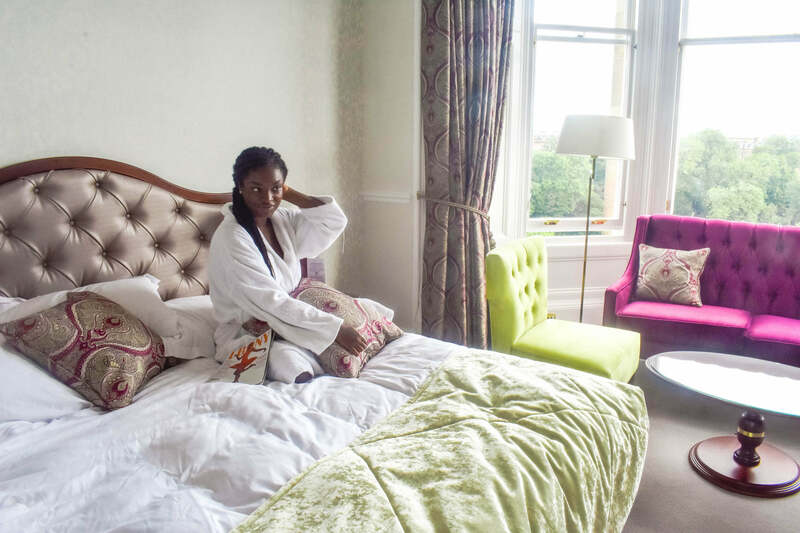 This post is a review of The Bonham Hotel, a luxury boutique hotel in the West End area of Edinburgh. 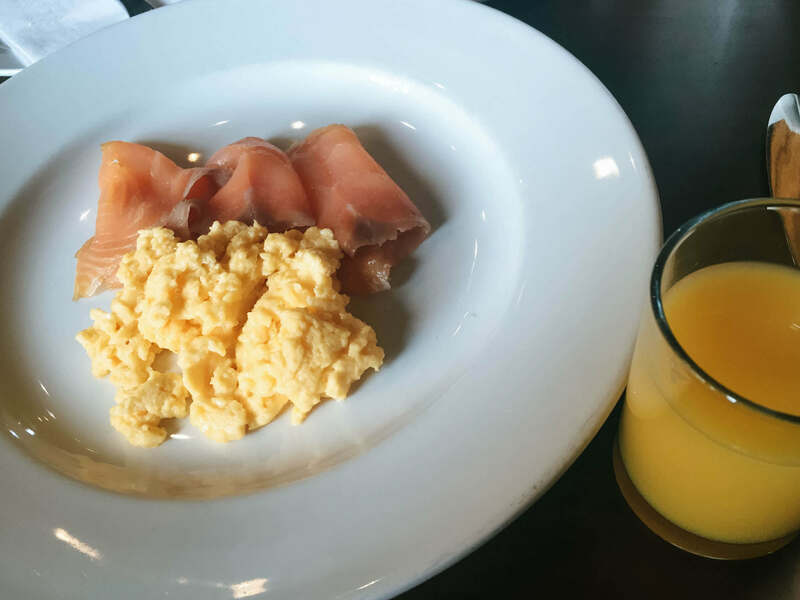 I’m going to tell you all about my stay to show you why The Bonham Hotel could be a great choice for your trip. Disclosure: my stay at the Bonham Hotel was sponsored by the management. All opinions are my own, and this review is voluntary. After checking in with two friendly receptionists, another staff member came over and grabbed my luggage. He then directed me to the elevator and up to my room. Before leaving, he told me more about the amenities at the hotel and urged me to call if I needed anything. There was lots of care and attention from the beginning, which made me feel oh so welcome. 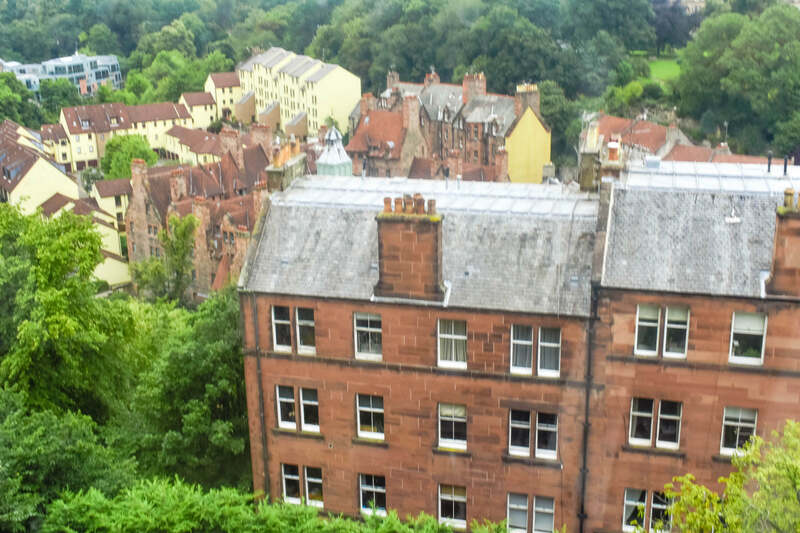 The first thing I thought when I walked into my room was ‘Wow, this place is stunning!” I walked over to the expansive window, which had views of Edinburgh Castle and the city in the distance. The furniture was green and purple furniture was tasteful and added a splash a splash of color to the cream/white room. 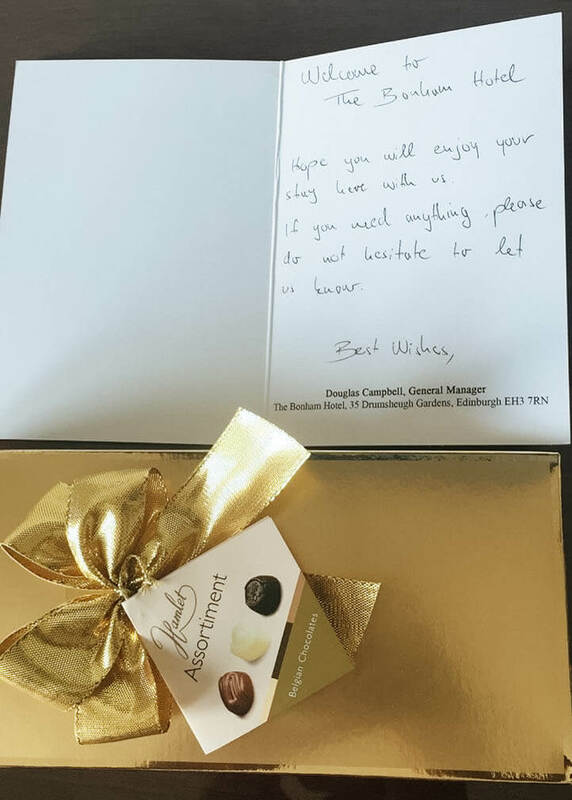 I headed over to the dresser to find a handwritten welcome note and a box of Belgian chocolates. What a nice touch. Another thing I appreciated about the room was the abundance of wall sockets to charge my electronics. There were at least 8 of them. It drives me up the wall (pun intended) when hotels don’t provide enough wall sockets so well done. Exhausted from a long walk, I collapsed on my Queen-sized bed. The mattress and linens were plush and soft with a fresh scent. The bed sheets were equally comfortable. I decided to take a nice, long bath and headed over to the bathroom. It was probably the cleanest I’ve ever seen in my life. There was both a walk-in shower and a bathtub. Get full access to unpublished solo travel guides, travel checklists, packing lists, giveaways, and more. The hotel is located inside three old Victorian homes that were merged together. The interior has a regal air – the decor is the type you’d find inside a palace. Overall, this hotel just screams luxury and comfort, with a tastefully decorated interior, modern furniture, and breathtaking views. There are four floors, which you can access via elevator or the palatial stairs. If you stay here, book a room on the highest floor possible. The views are to die for! Now onto my favorite part: the food. 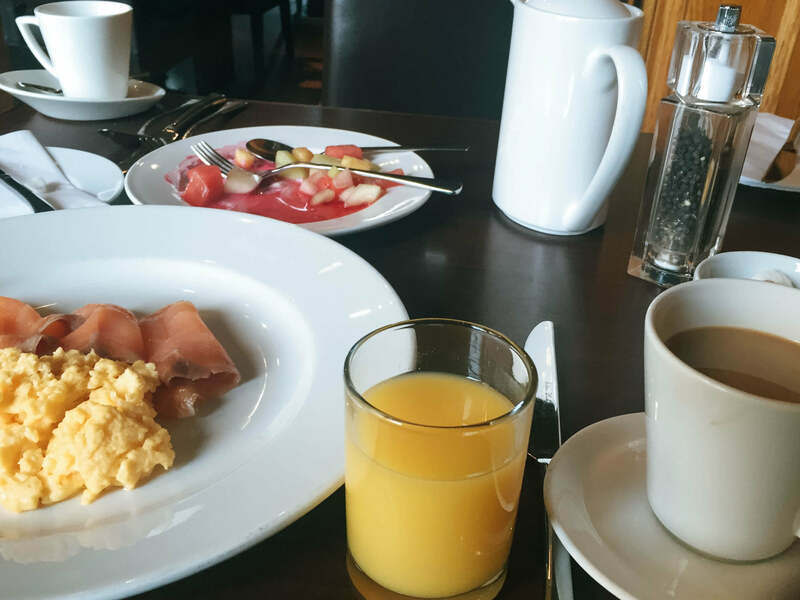 The hotel serves gourmet breakfast every morning from 7 am to 10 am. You can order from their wide menu and then help yourself to an assortment of fruits, juices, yogurt, pastries, and cheeses. 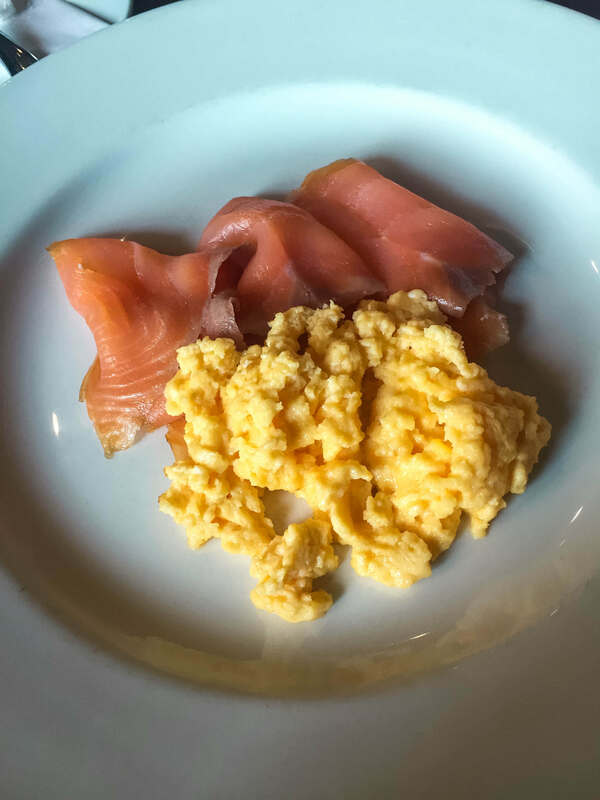 I ordered smoked Salmon with scrambled eggs and thought it was delicious, although the portion size was a bit small. My breakfast came with a side of toast and coffee so I used those and the fruits to fill myself up. I loved the freshly-squeezed orange juice and helped myself to several glasses of that. 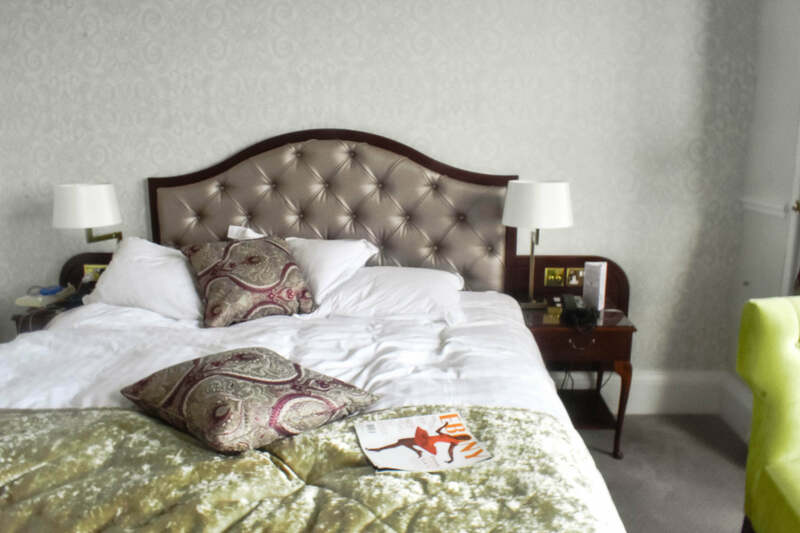 The Bonham Hotel is located in the West End of Edinburgh, a classy, upscale part of the city. There is a bus station about a 5-minute walk from the hotel. 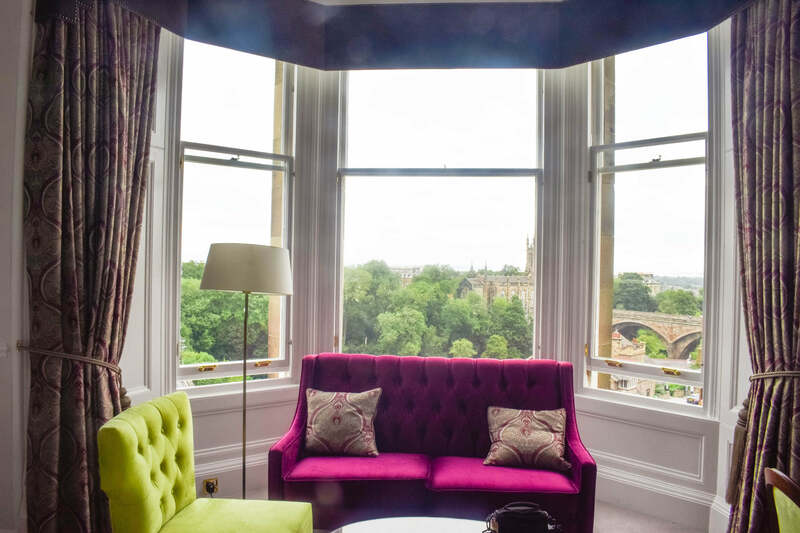 From there, you can get to major attractions like the Royal Mile, Grassmarket, and Princes Street within 10 minutes or less. You can actually walk to the Royal Mile from the hotel in 15 minutes. The neighborhood is really quiet so it’s great if you’re looking for a good night’s sleep. The surrounding area is an affluent neighborhood with large Victorian homes and lots of greenery. There are also a number of fashion boutiques just around the corner. It’s also important to note that the station for the Skylink 100 airport bus is a 15-minute walk from here so that’s really convenient. The Bonham Hotel falls into the affordable luxury category. You’ll get a 5-star experience without paying an arm and a leg. The cost of this hotel is about the same cost as a major chain hotel in America, like the Hilton or the Marriott. The Bonham is classified as a 4-star hotel but the attentiveness of the staff and the luxurious rooms make it on par with 5-star hotels. Prices depend on the season. I went in August, which is Fringe Festival season, so prices were in the $200-$250/night range. Without a seasonal increase in demand, you’d pay about $175/night. Superb. I can’t really find any fault with the Bonham Hotel. I loved my stay so much that I decided to write this review. I’ve never written a hotel review before, to put things in perspective. 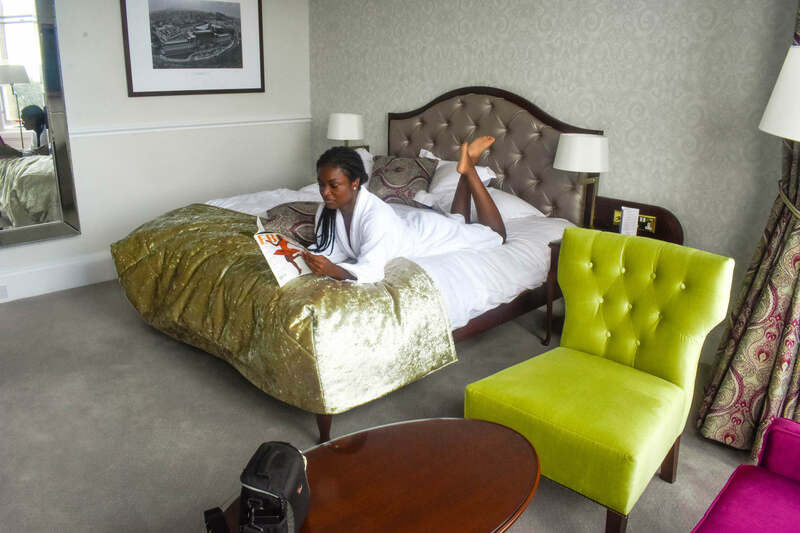 The hospitality, location, food, and room are everything you need for a comfortable and relaxing stay in Edinburgh. Everything here runs like butter and the staff goes out of its way to make sure you have a 5-star experience. When I return to Edinburgh, I would definitely stay here again in a heartbeat, probably on the fourth floor. If you’re interested in the Bonham Hotel, you can get $25 off your stay when you book through booking.com. I think we stayed in the same room as you? 106? It’s a fabulous room we really enjoyed it, we’re thinking of going back at the end of the month! Hey, I think I stayed in 106! Really enjoyed the hospitality and the views. I’d definitely stay there again.